During our travels in Uruguay we’ve run into all kinds of people from all kinds of places and they usually share two things in common: the first, right from the get go they never intended to spend much time in Uruguay. Why? The biggest reason we’ve heard people cite is there just isn’t any information about Uruguay so people have no idea what’s here until they get here. It’s a place on the trail that connects Chile, Argentina and Brazil and it’s used as a stop off on the way. What’s the second thing they share in common? They wish they’d planned to stay for longer. Why do 99% of people never consider Uruguay as a place for their next vacation? 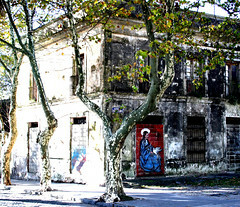 It’s true that Uruguay doesn’t share any of the superlative experiences that its neighbours have to offer. There are no Andes, no glaciers, no rainforest, and no indigenous people. But don’t let that fool you into thinking there’s nothing here. There is. And it’s why the 1% are smiling. So why do the 99% make the 1% smile? “Ssshhh,” said Sarah with a glint in her eye. She tapped the side of her nose and then beckoned for me to follow her round the corner. She reached up, cupped her hands around my ear and then whispered quickly, all the time keeping an eye out for anyone who might disturb our tête-à-tête. When she finished we grinned wickedly and I promised to keep the secret. And that’s exactly why the 1% smile. If you’ve already found Uruguay and discovered what it has to offer, it’s just like having one of those great big secrets you used to have as a kid. It feels good and you’re in a pretty exclusive club. You’re in the know when everyone else is simply not seeing what’s right in front of their eyes. And yes, you smile. What makes Uruguay such a good travel secret? Like we said, it’s not because Uruguay has the biggest or the best of things. That’s not what’s it about. In fact, Uruguay is small when you compare her to her neighbours. No. It’s her personality and character that make her worth a visit. And once you find her, she has a way of getting under your skin. It starts with the people. They’re an incredibly friendly bunch who will happily spend the time of day with you if you’re willing to say hello. Do you need great Spanish to appreciate this aspect of Uruguay? Well sure, it helps if you do, but we don’t and we’ve managed just fine. In our broken sentences and limited vocabulary we’ve managed to hold a 2 hour conversation with a lovely lady and her son from San Gregorio who got chatting with us on a local bus. They invited us back to their house for lunch where we also met her husband, and within 4 hours we’d made some new friends in a way we never expected. And this is just one of many similar experiences we’ve had while we’ve been here. If you love the countryside and wide open spaces, Uruguay is a great location. Outside the main cities there’s mile upon mile of fields, trees, and traditional agricultural business. The roads are relatively empty compared to anywhere else we’ve been so you can enjoy the scenery as it rolls out before you. If you fancy driving, a weekday run on one of the main National Rutas will see cars passing you in the opposite direction maybe once every 2 or 3 minutes… if that. Fancy a romantic moment anyone? An even bigger surprise is the coastline. It’s endless. Or at least it seems that way. There’s the choice of hip and trendy beaches where the rich and famous hang out in high season. Or, if you prefer, find your own private beach from one of the many that line this 200km coastline. It really is up to you. What does local Uruguayan culture involve? Start with food and a traditional parilla meal. Move on to a local vineyard for a taste of the Tannat grape. Then think about a visit to a local estancia for a gaucho experience you won’t forget. Add in Carnaval and other local festivals and there’s plenty to keep you occupied. I lived there for 13 months – the winters are gray, but the summers are warm and sunny. The people are the real reason to go. The are warm, open, and caring.